But the woman I sold The Mindwarpers to thought it was a big deal. She was evidently a big Eric Frank Russell fan, and she had no idea the book existed. It was originally published by Lancer in 1965 with a Richard Powers cover and a cover price of 50 cents, and she was thrilled to find it. She practically did a happy dance right there in the booth. I took her three bucks and told her I was glad it had found a good home. 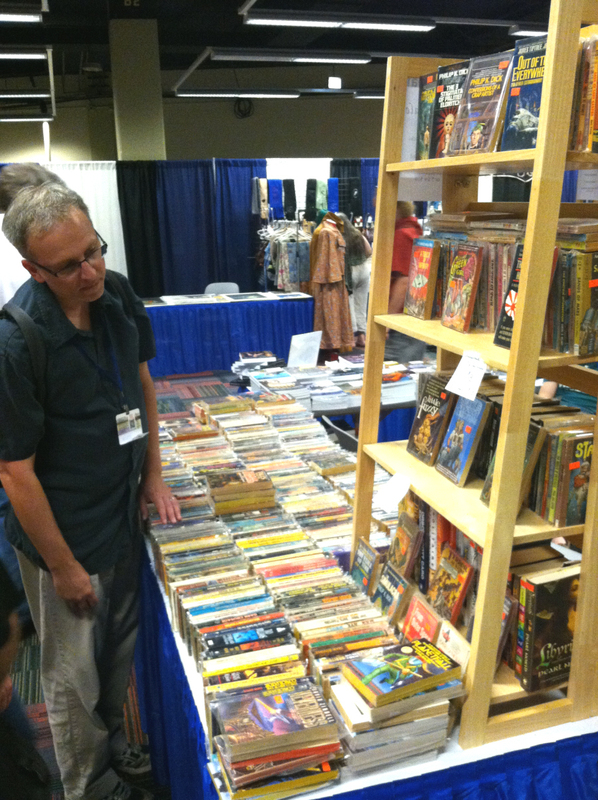 This past weekend I was in Chicago for Chicon 7, this year’s World Science Fiction Convention… I was looking along one of the many stalls of second hand books… There were some volumes of Eric Frank Russell, and I was looking at them and I thought “Why are you even looking, Jo? 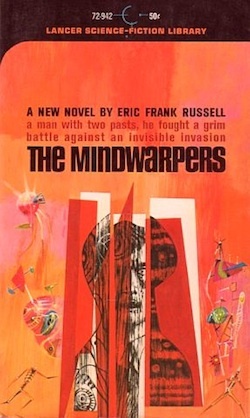 It’s not like there’s going to be any new Eric Frank Russell. He’s been dead since before you knew he was alive.” And there was a new Eric Frank Russell. I’m not joking. It’s called The Mindwarpers, and I bought it but I haven’t read it yet. I am delighted to have it. But I had no idea I wanted it because I had no idea it existed.. I found it through pure serendipity and the massive gravitational pull of a Worldcon dealers room. Physical books sitting next to each other. But I was looking more out of nostalgia than anything else. There’s Wasp. There’s dear old Next of Kin. Wait! What on Earth is that? How did I miss it? Or did it fall through a wormhole from another dimension?… I may read The Mindwarpers and write about it soon, if I don’t wake up soon and discover I’m actually still fifteen. But there’s something so enticing and happy-making about having a new Eric Frank Russell, which I never thought I’d have again, that I may keep it on the shelf unread until I get diagnosed with something terminal. That’ll give me something to look forward to! Jo Walton won the Hugo Award Sunday night at Worldcon, for her novel Among Others. I’m glad finding The Mindwarpers became part of the experience of that historical weekend for her. It’s always nice to get three bucks, but the greater pleasure is finding a new home for these treasures. That, and getting them out of my basement. Yes, I remember that. As I recall when you congratulated her, her response was “F— you very much,” which didn’t impress me. Perhaps it was said in jest, but your congratulations were very sincere. My desire to read her novel AMONG OTHERS peaked when it won the Hugo on Sunday, but after that it has fallen away rapidly.